The area of Bludenz, Schruns-Tschagguns and the valley stretching towards the scenic Silvretta Mountain Range is called the "Montafon Valley". Bludenz itself is a transport hub that centrally connects Vorarlberg with the civilised world through the railway network and the highway. The city itself is more or less a stop-over destination with few sights of interest for the tourist. If you have time to kill, you could check out the Suchard chocolate factory, the reason why the city celebrates an annual "Milka Chocolate Festival" which is popular with the little ones. Beyond that, Bludenz has a 16th century parish church with an adjacent city gate, a remain of the town′s fortifications. Inside the gate′s tower, the town museum is housed in case you want to explore a local interest. Most tourists, however, use Bludenz as a stepping stone into the mountaineering paradise of the Montafon Valley and move on towards the twin-villages of Schruns-Tschagguns. Let me try to write that in a way that the pronunciation becomes comprehensive for English native speakers: Something like "Sh-roontz-t-sh-uh-goontz", which sounds extremely funny not only to the foreigner, but to anybody who comes from outside Vorarlberg. The two villages live mostly off the skiing tourism of the winter season, but they do make good hiking bases, too. Beyond that, the tourism board works hard on fighting the somewhat old-fashioned stink of hiking holidays as an old people′s thing, so there are plenty of opportunities to try all sorts of sports that are more appealing to youngsters that plain hiking. These include paragliding, mountain biking and water sports at the local alpine lakes. Note that getting around in the Alps is fairly easy in this area due to excellent public transportation and a tight network of cable cars and ski lifts that run both in the winter and the summer season. The biggest attraction of the area, however, is the Silvretta Hochalpenstraße. This road takes visitors to near the 3320 metre high summit of Mount Piz Buin and ranks among Europe′s most scenic mountain roads. The dramatic landscape of the Alps are supplemented with the Silvretta Reservoir, an artificial lake. The Silvretta mountain range marks the border between Austria and the Swiss canton of Graubünden. 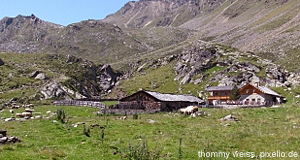 From the highest point of the Silvretta Hochalpenstraße, you can go to the Tyrolian village of Ischgl in the Paznaun valley, which is similarly scenic. As everywhere beautiful in Austria, you should expect vast amounts of tourists especially during the summer season, which might somewhat spoil all Heidi-romanticism.